My husband and I celebrated our wedding anniversary last week in San Francisco. We were both ready for a mini-vacation, and the City by the Bay was the perfect spot to relax and have fun. We were only going for the weekend, so I “bravely” left my laptop and camera at home. Armed with only our cell phone (chiefly used for navigation, taking photos, and Instagram posting), we were off to a leisurely weekend, with no real agenda or schedule to follow. As a bonus, we decided not to rent a car so we didn’t have to deal with traffic and finding parking spaces! A true vacation, indeed! We stayed at the Palace Hotel, which is conveniently located near a BART station and several bus stops. We wandered around the city, relying on our own feet and the city’s excellent public transportation to get around. 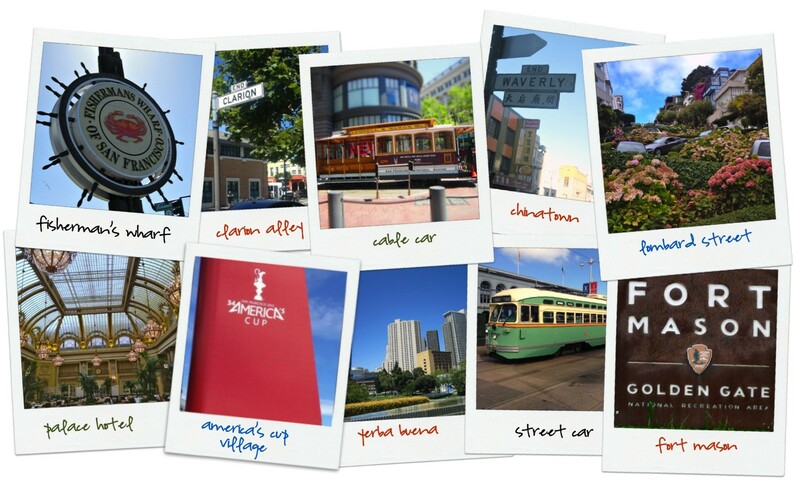 We visited a couple of our “go-to” places like the Ferry Building and Saturday farmers market, several shops around Union Square, and the beautiful and peaceful Yerba Buena Gardens, and we also took the opportunity to explore the Mission and Cow Hollow neighborhoods. We window-shopped all along Union and Fillmore Streets and found a cute little French bistro to have lunch. We walked from Marina Green to Fisherman’s Wharf to the America’s Cup Park on Pier 27/29, enjoying the views and the people watching. We hopped on the street car when it got too crowded and too hot to walk. I guess even San Francisco gets a few warm days; I never needed a sweater all weekend. We always enjoy our visits to San Francisco and this past weekend was no exception. 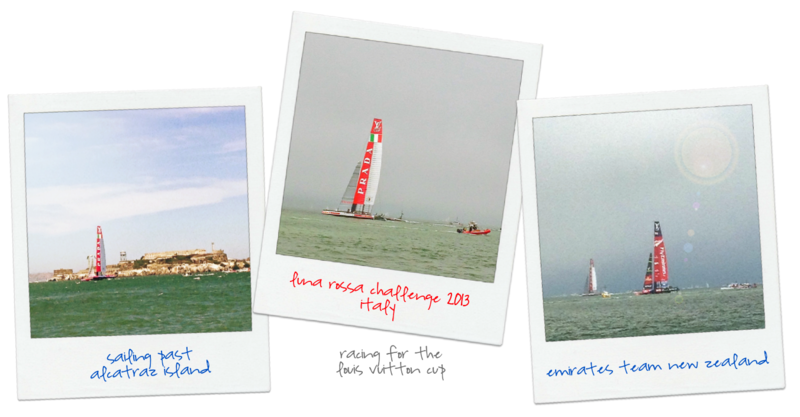 We have followed the America’s Cup for years and we were excited that the racing schedule coincided with our stay. We sat on the seawall at Marina Green and watched Emirates/Team New Zealand clinch the Louis Vuitton Cup, decisively beating Italy’s Luna Rossa. We had a great view of the Golden Gate Bridge, Alcatraz Island and the boats from our vantage point, before the fog rolled in and briefly hid everything from view. It was really fun to watch the catamarans as they sailed up and down the bay. Afterwards, we explored the America’s Cup Village, where like a typical tourist, I bought a t-shirt. While walking down Mission Street, we noticed several people, many with cameras, coming and going from this one alley. Intrigued, we went to check it out. As we got closer we could see the alley was lined on both sides with big, colorful murals. We had inadvertently stumbled into the Clarion Alley Mural Project (CAMP), and we were so glad we did. CAMP is a vibrant and colorful collection of socially and politically relevant street art with the stated goals of social inclusiveness and aesthetic variety. Some murals stay for weeks, while others get painted over quickly to make room for more art. As we were nearing the Valencia end of the alley, we saw an artist in the middle of painting a mural, so there is always something new to see. Clarion Alley runs between Mission and Valencia, parallel to 17th and 18th streets. We started at the top of the iconic Lombard Street and walked down to the bottom. It was a busy day, with lots of foot and car traffic. We noticed the driveways and door steps of residents who actually live along this popular destination and wondered how they cope with the throngs of tourists who are constantly invading their neighborhood at all hours of the day. I’m surprised there aren’t more accidents as pedestrians blocked the streets at will and cars stopped suddenly to let passengers out to snap a few quick photos at the bottom of the winding road. 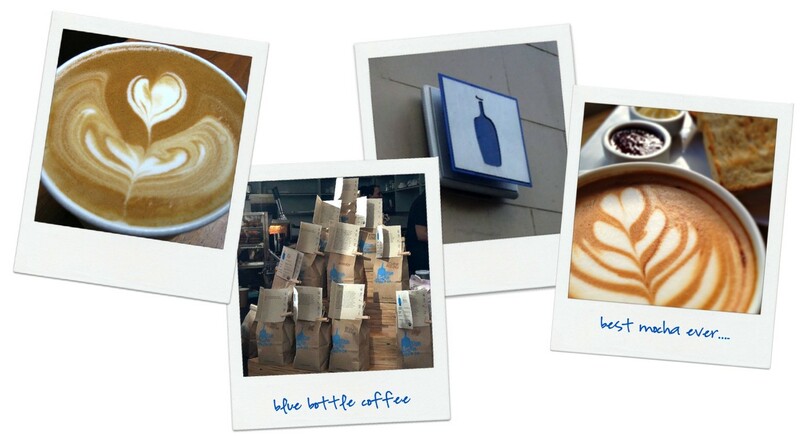 Blue Bottle is one of our favorite coffee bars, and it is always high on our list when we’re in San Francisco (and New York, as well). We usually stop at the Ferry Building location, but this time we also went to the café at Mint Plaza for breakfast. There were some great looking waffles and egg dishes, but I opted for some excellent thick-cut toast with whipped butter and jam to go with my excellent mocha and Chris raved about his salted caramel and peanut butter muffin. 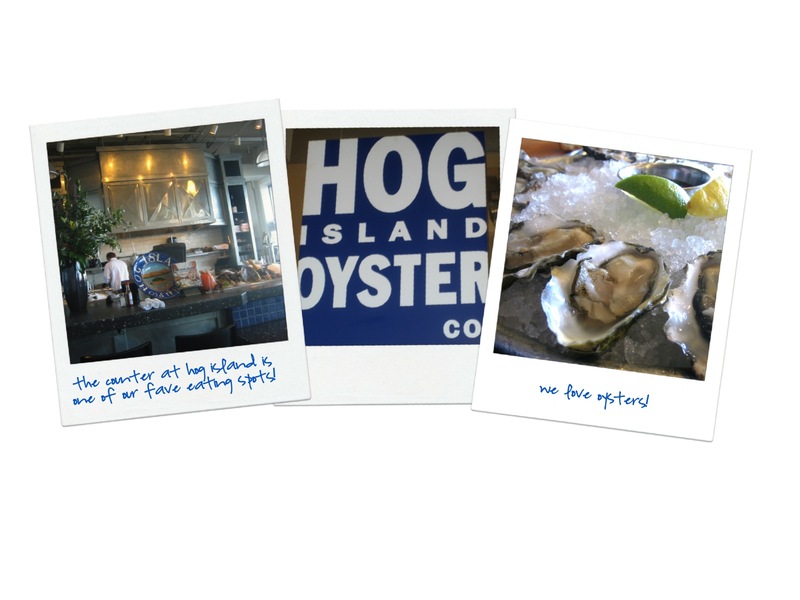 We are oyster lovers and Hog Island Oyster Co. at the Ferry Building is always a must when we’re in San Francisco. We enjoy sitting at the counter and watching the kitchen staff shuck dozens of oysters with ease while the chefs prepare heaping bowls of oyster stew and steamed mussels, not to mention the beautiful view of water and the Bay Bridge. Oh, by the way, the bread is to die for! We’ve wanted to eat at Mission Chinese Food since it opened, for its “Americanized” Chinese Food, but we haven’t made it until now. It’s a small, hole-in-the-wall restaurant, with dim lighting provided by strings of Christmas lights, loud, club-like music, and food served on mismatched, sometimes chipped plates and bowls, which all adds to the whole experience. Service was ok; abrupt, efficient and to the point, if not a bit rushed. The place was empty when we arrived soon after it opened, but it filled up quickly. Our favorite dish was the hickory-smoked Cumin Lamb Ribs, which came out on a sizzling plate with tons of pickled onions, scallions, and cilantro to cut the richness of the tender, fall-of-the-bone lamb. Absolutely delicious! As our server put the plate down, she warned us not to breathe in too deep as the smoke and spice really hits the nostrils with a punch! The Westlake Rice Porridge was full of flavor, with bits of oxtail, crab, ginger, and scallions floating in the well-seasoned broth. We’ll definitely be back! We had tried to get in to Flour + Water once before, but were discouraged by the long lines and no reservations policy. Now, reservations can be had through Open Table and I was able to snag one for 8:15pm Sunday night. Our lovely table, right by the window, was ready when we walked in. The restaurant had a friendly, casual vibe with an acceptable noise level so we could carry on a pleasant conversation. Service at Flour + Water is friendly and attentive, without being intrusive. We split a nice salad of Little Gems lettuce , roasted sweet corn, and pancetta with a deliciously tangy and zingy Green Goddess dressing. Since Flour + Water is known for their house-made pastas, we opted for two dishes that were highly recommended by our server, the Agnolotti Dal Plin and the Teleme Scarponocc with Aceto Balsamico. Both pastas were nice and light, with the perfect amount of sauce. Delicious! We both also enjoyed the side of lightly breaded Crispy Baby Squash with Fried Lemons, especially the thinly sliced lemons, which were delicate and crisp. My favorite part of dinner was the dessert, Chocolate Budino with Espresso Cream and Sea Salt. The combination of the rich budino, with the light as air espresso cream and sea salt was the perfect ending to a wonderful celebratory dinner. Glad to see you enjoyed San Francisco, my home town. There is always something to do and something great to eat… I need to go back soon to see my parents and eat good Chinese food. 😉 take care and thanks for sharing… enjoying your blog! Happy anniversary! You are making me miss San Fran so much. We went there for our anniversary this past June and LOVED it. Congratulations for your Anniversary and website!!! please say “Hello” to Chris, I worked with him in the same company. You did great with the iPhone! Isn’t it fun to look at things with a different eye? And what a great anniversary you had!